Hatched chicks are so much fun and they sure are cute. 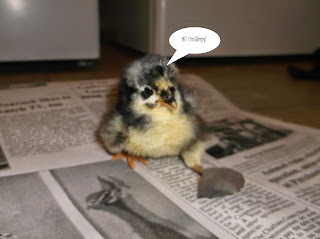 We had one chick that was hatched with curled toes. I researched this on the internet and found a consensus that if taken care of early, the chicks' toes can straighten out. We tried the cardboard sandal with vet wrap. It was not possible for me to do even with my daughter to hold the chick. Between how tiny the chick was and trying to wrap the vet wrap around its tiny toe while the chick of course would not hold still, didn't work. Then I looked for another solution and found the suggestion of thick sturdy tape. We always have duct tape, so I gave it a shot. Now the chick is running around sporting one duck flipper. It started out with two, but one foot wasn't so bad and it seemed to be slipping with the duct tape. Sadly, we have named it "gimpy". We will probably love this chick best of all. . .